Why Sell with The Hollers Team? The Hollers Team - Your Move Matters! 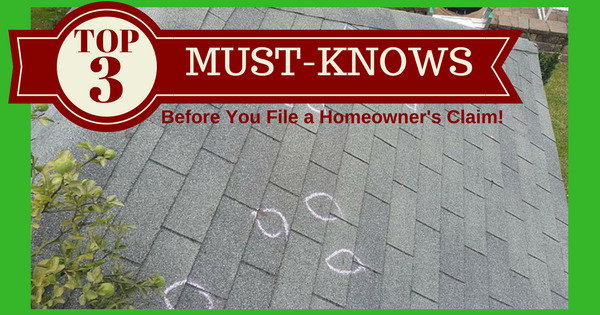 Before Your Homeowners Claim – Top 3 Must Knows! Realistically, it’s not IF, it’s WHEN. At some point, if you are a homeowner, especially in North Texas, a homeowners claim is likely. In the Dallas area, we get hail storms, tornadoes, and of course, water damage from broken pipes and water heater tanks are more common than many realize. #1 – Know Your Coverage. John Allen, owner of Community Insurance Advisors of Plano, TX talks about the super-important difference between the “Named Perils” policy sold by many name-brand companies, compared to “All-Risks” type policy. It’s okay to shop price, it’s not okay to be misled about your coverage, literally on the roof over your head! Benny Wright, regional director with Jansen Adjusters International, personally visits the fire-damaged and flooded homes, discovers the damage caused and learns the stories first-hand from Texas homeowners about disputes and delays with insurance claims. The stress and financial distress can be enormous! #3 – Coordinate a meeting of minds between your adjuster and contractors. Why are these logical, yet easily-missed tips considered Must-Know? Because insurance is purchased based primarily on price, and so it’s sold in mass media advertising by quoting the lowest price (and often coverage) possible. The choice is with the consumer, yet they should be informed in ways they are not so most people don’t realize the differences. The differences get missed in the details. While it’s good to get the bundled-deal with home and auto, coverage details matter. The difference in coverage is often huge while the price is negligible, for “All Risks” vs. “Named Perils” and to get the water endorsements necessary to assure all physical and financial damages are covered. Get Your Free Home Value Now!